A government-backed marketing campaign to reassure Japanese tourists that they can still smoke in Hawaii has lit up a public health row in the US islands. Hawaii Tourism Japan, which markets the islands in Japan, says the move is vital as many Japanese tourists wrongly think Hawaii has a blanket smoking ban. The tourism group says that as a result of the misunderstanding, Japanese visitor numbers have fallen sharply. Hawaiian anti-smoking groups said the marketing move was "very unfortunate". "This is not really sending a message that Hawaii is concerned about good health," said Kathy Harty, interim president of the Coalition for a Tobacco-Free Hawaii. The marketing campaign by Hawaii Tourism Japan has been called "Smoking with Aloha". Aloha is the main word of greeting in the Hawaiian language, but its use in this smoking context is somewhat unfortunate, as it directly translates as "breath of life". Under the initiative, Hawaii Tourism Japan is giving away some 40,000 free ashtrays with a flower logo and the words "Keep Hawaii Clean". Smoking in enclosed public places was banned in Hawaii last year. Hawaiian tourism officials said the marketing campaign was necessary in Japan as some Japanese news reports had mistakenly suggested that smoking was now completely prohibited on the islands. But Ms Harty said: "We shouldn't give the message that aloha means smoking." 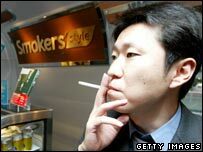 Smoking in Japan remains as popular as levels in the West, and the country is home to the world's third-largest privately-owned cigarette manufacturer - Japan Tobacco.